It has been a year filled with big news stories that shaped the conversation on race, politics, privacy and much more. 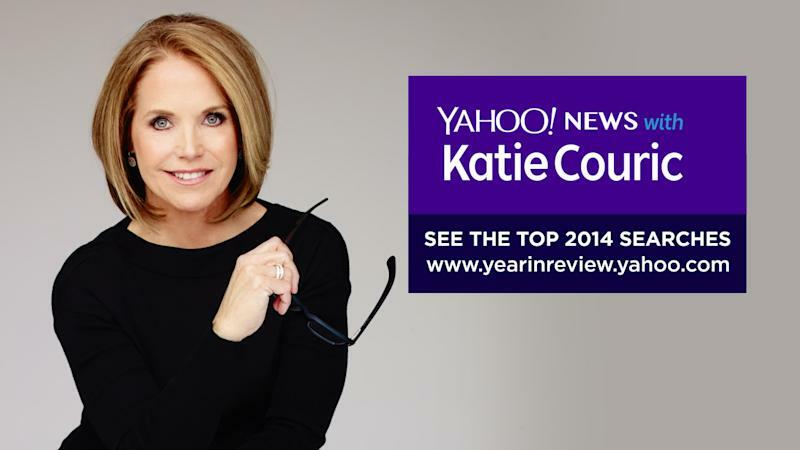 Yahoo Global News Anchor Katie Couric takes a look back at your most searched news stories of 2014. 10) Obamacare: Formally known as the Affordable Care Act, President Barack Obama’s plan to reform health care has been plagued by technical glitches and consumer confusion. Kathleen Sebelius, who led the rollout of the new law as health and human services secretary, stepped down in April. But now, a second act has begun. Open enrollment is under way until mid-February, but stay tuned for a looming Supreme Court case that could dismantle the entire program. 9) Domestic violence: A viral video of NFL running back Ray Rice punching in the face his then fiancée, Janay, sparked a national conversation about domestic violence. Rice was suspended indefinitely by NFL commissioner Roger Goodell in response to public criticism that the initial decision to ban him for two games was inadequate. Rice appealed and won and has been reinstated in the league. 8) Islamic State: It was a brutal year in Iraq and Syria, as the terrorist group calling itself the Islamic State, or IS, gained momentum and captured territory throughout the region, killing thousands along the way. The group posted online barbaric videos of beheadings. Two American journalists were among those executed. The United States continues to fight back through airstrikes on the group in Iraq and Syria. 7) Jodi Arias: The fate of Jodi Arias lies in the hands of a jury hearing a retrial of the sentencing phase of her case. Arias was convicted of killing her boyfriend Travis Alexander, but the first jury was unable to agree on whether she should receive the death penalty or spend the rest of her life in prison. 6) Ferguson: Racial tensions erupted this year in Ferguson, Mo., after Michael Brown, an unarmed black teenager, was shot and killed by a white police officer, Darren Wilson. Protesters clashed with police for weeks after the shooting. The violence escalated again after a grand jury voted not to indict Wilson. He has since resigned from the Ferguson Police Department, citing safety concerns for his family and fellow officers. 5) Malaysia Airlines: The embattled airline made news for all the wrong reasons this year. In March, Flight 370, carrying 239 passengers and crew, vanished during a routine flight from Kuala Lumpur to Beijing. A months-long air and sea search has so far failed to turn up any sign of the missing aircraft. In July, another Malaysia Airlines plane, Flight 17, carrying 298 people, was shot down over eastern Ukraine, killing all on board. Ukraine and U.S. officials blame separatist fighters backed by Russia for downing the jetliner. 4) Leaked photos: The Internet was abuzz after it was reported that hundreds of private photos of celebrities, mostly of women, had been stolen and posted on various websites. Jennifer Lawrence and Kate Upton were among those who confirmed the photos’ authenticity. Hackers are believed to have conducted a sophisticated and targeted attack on Apple’s iCloud service to obtain the material. 3) Midterm elections: He wasn’t on any of the ballots, but the 2014 midterm elections turned into a referendum on President Barack Obama’s performance in office. Voters gave Republicans a decisive victory as they took control of the Senate and padded their lead in the House. 2) The death of Robin Williams: His legions of fans were shocked and saddened when it was revealed that the comic genius and Oscar-winning actor had taken his own life. Williams, 63, had battled depression and substance abuse throughout his life. It was revealed after his death that he was also in the early stages of Parkinson’s disease. 1) Ebola epidemic: It started with just a few cases in Guinea, and became the deadliest outbreak of Ebola on record. The virus spread throughout West Africa, claiming more than 5,000 lives. In September, the first case of the disease in the United States was diagnosed at Texas Presbyterian Hospital. Thomas Eric Duncan, a Liberian citizen who had recently arrived in the United States, died of complications from Ebola. Two nurses who treated him also contracted the virus but recovered. Duncan’s death raised serious questions about the capacity of U.S. hospitals to effectively treat the disease and to protect health care workers treating the infected.